Create, Manage and Track all your Customer's Tickets. In One System! Managing your customer queries has never been easier with Eworks Help Desk Software. 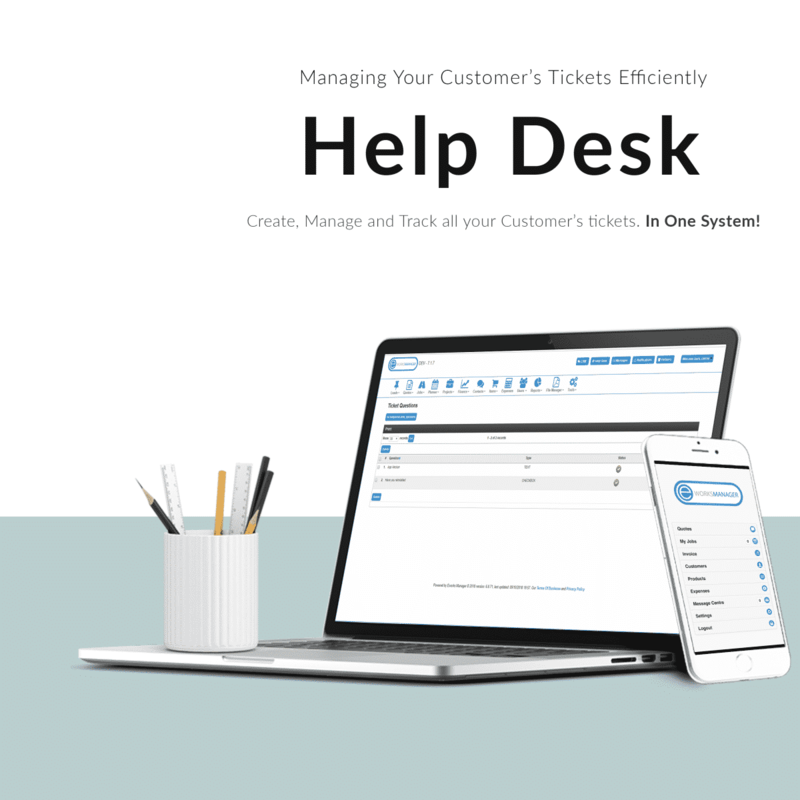 Being able to create, manage and track all your customer's tickets, in one system, will make sure you are aware of any issues, allowing for a quicker response time to make sure your customers are satisfied with your service. Tickets can be created on either your Eworks admin system by a member of staff or by your customer from the customer login portal. Your customer is then encouraged to stay connected to you other than having to phone in or email for assistance – that way each inquiry is tracked and not lost or forgotten about. What your staff or customer will do to create a ticket is; select the category of the issue, select what the issue relates to, give a description of what the issue is and add an attachment if needed – it’s as simple as that! Create your own personalised questions for your customers to answer so that when they log a query they can quickly give you more information about the problem they are experiencing. This alleviates the time spent by your staff having to make a trip to the customer's site to inspect the problem or having to call in to find out more information. Questions are specific to the categories you set up in the system. Your Customers can then give you the relevant details you need to find a solution for them. Once your customer has answered the relevant questions you have selected for them, you are able to respond immediately with an answer/solution. Solutions are added to the Eworks Help Desk by simply selecting the category they match to and explaining the action the customer needs to take. When a solution is added to a ticket you can make it visible to the customer through the login portal. Or you could inform them of the solution by sending them a direct email from the system. Categorising your customer tickets is the first step in knowing what the issue relates to. Simply add in your specific categories, select which employee who will tend to each category and match the relevant question and solution to make the process run more efficiently. Categories allow you to separate your customer queries which helps you designate a query to the correct member of staff. Each category can be assigned a level of priority from low, medium and high. This will indicate which tickets need to be dealt with more urgently. Keeping a track of all your customer's queries is a very important part of any business. It ensures your customers are happy which means there will still be business to come. Eworks Help Desk Software can keep you in control of an issue, from start to end. If you would like more information on our Help Desk feature please get in touch and grab your 14-day free trial today!